A car insurance policy can consist of multiple parts, each paying for a different type of problem. If you don’t understand all the parts, you might not know what your current policy covers. And that sets you up for a bad surprise if you’re in a car accident. 1. Let’s say you’re driving down a road one night when suddenly a deer appears, and you hit it. What type of insurance pays for the repairs to your car? B, comprehensive insurance. It also pays for problems such as vandalism, hail damage and car theft. Liability. Learn more about what car insurance covers. 3. If you were in a car accident yesterday, can you buy insurance for it today? B. There’s no retroactive car insurance. 4. What’s the name of the insurance that pays your medical bills if someone crashes into you and they don’t have auto insurance? 5. Which one of these is never a factor in car insurance rates? B. Religion is not allowed as a factor in setting rates. Some insurers use education level in pricing, and occasionally give discounts based on where you went to college. The use of credit in car insurance pricing is banned only in California, Hawaii and Massachusetts. Car insurers often use home ownership as a way of judging whether you’ll make a claim, giving better rates to homeowners. 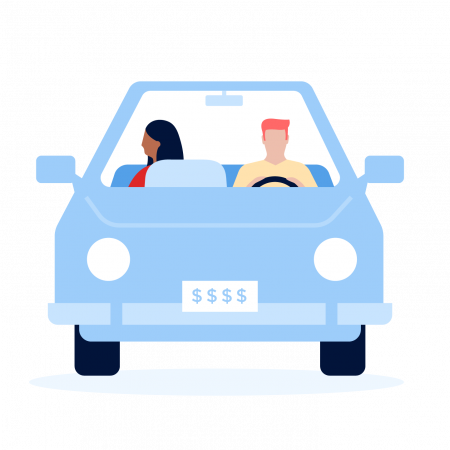 Take a look a how drivers with poor credit pay higher insurance rates in most states. 6. Insurance has a lot of acronyms. Maybe too many. What’s PIP? 7. Could you be the insurance policyholder for your mother’s car? B. Generally only the car’s owner can buy the insurance on it. 8. Imagine your car slides on ice, hits a tree and has substantial front damage. What type of car insurance pays for repairs? 9. Fill in the blanks with the correct word choices: If you drive your friend’s car and crash it, (1) insurance will be tapped first to pay for damages and he will be (2) . If you drive your friend’s car and crash it, his insurance will be tapped first to pay for damages and he will be mad. 10. Last one. How about a little Hangman: If you have an unresolved complaint about your car insurance company, who should you call? 0-4 right: It’s worth checking your car insurance policy to make sure you understand what you bought — and didn’t buy. 5-7 right: Not too bad, but consider reviewing your car insurance policy with someone more knowledgeable. 8-9 right: You have a good handle on the basics. 10 right: We assume you’re an insurance agent. Amy Danise is an insurance expert at NerdWallet, a personal finance website. Email: adanise@nerdwallet.com.